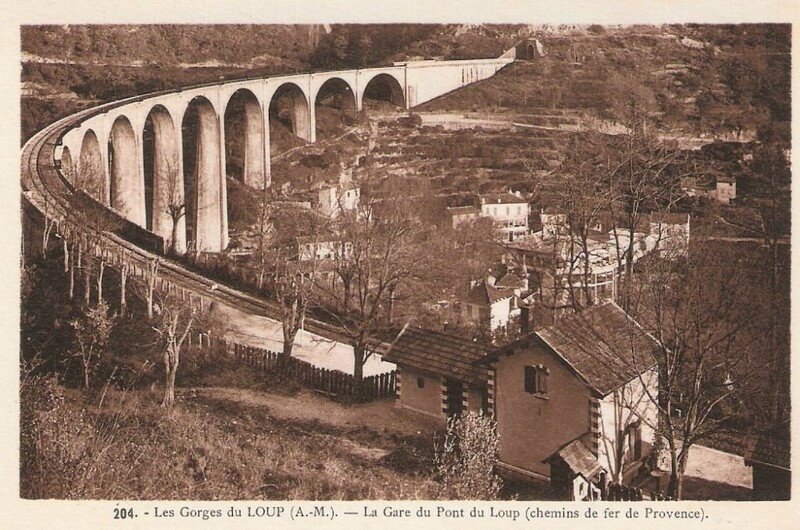 We travel on from Le Pont de Loup to Grasse. 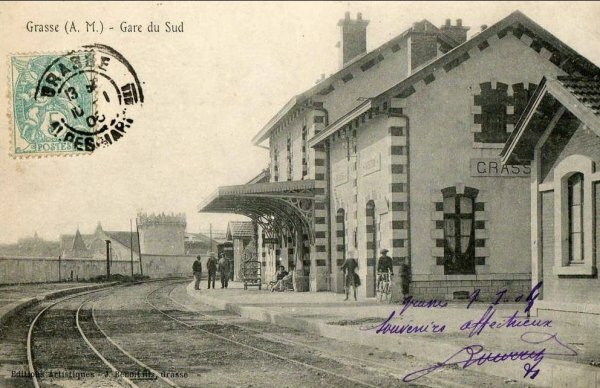 The next post in the Line de Central Var series will start at Grasse Gare du Sud. 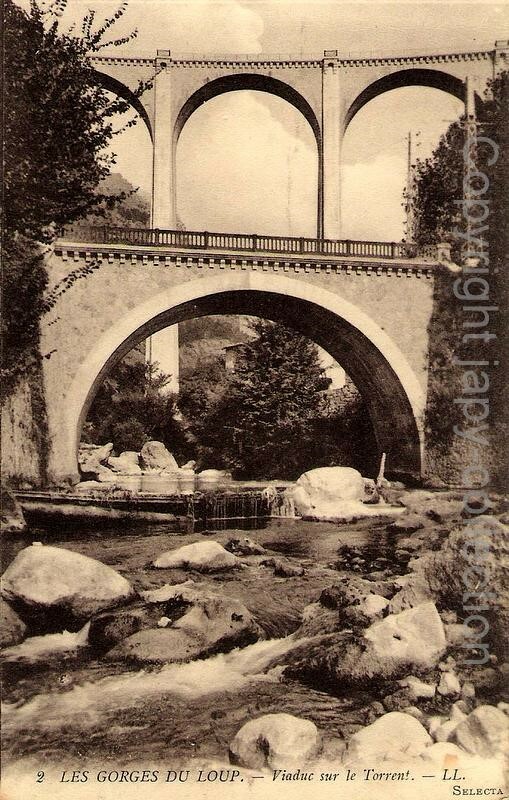 We start this section of the line with some more pictures of the iconic bridge destroyed by the Germans in 1944. 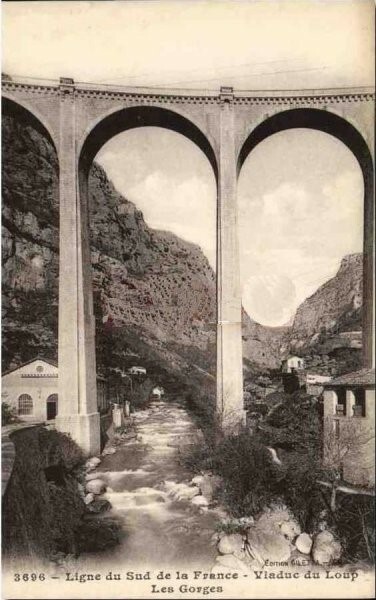 The viaduct features on a whole series of different post cards. 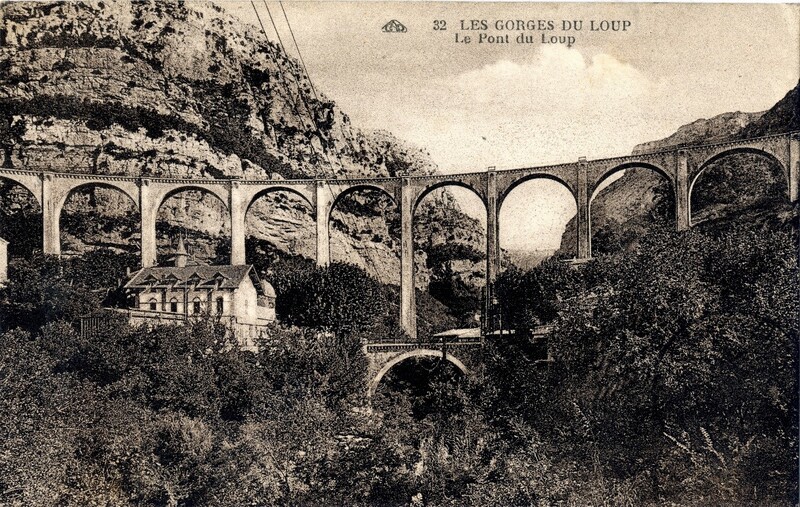 It dominated the valley and gave the Gorge de Loup a distinctive character over the 50 years or so that it was in use. 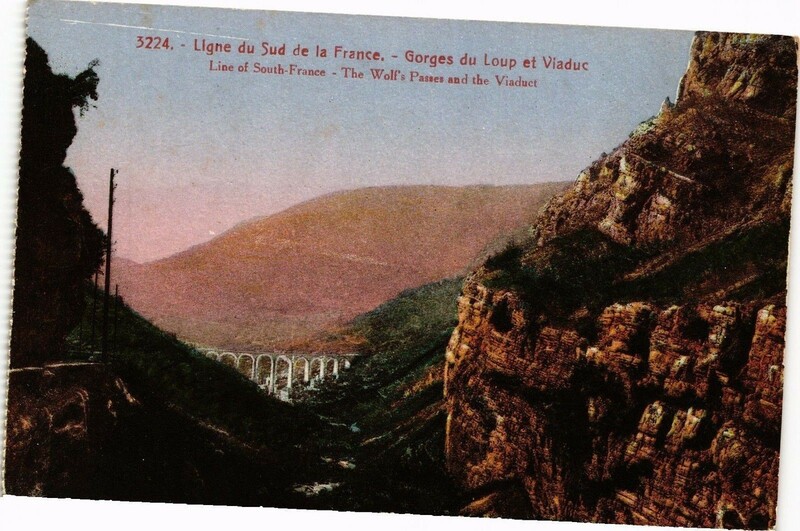 Some of the cards above and below illustrate a distinctive feature of the Central Var line. 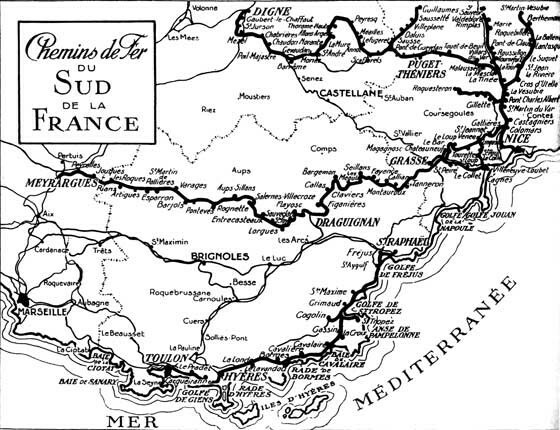 For many years the line was required as a diversionary route by the military for use if the coastal route was compromised. 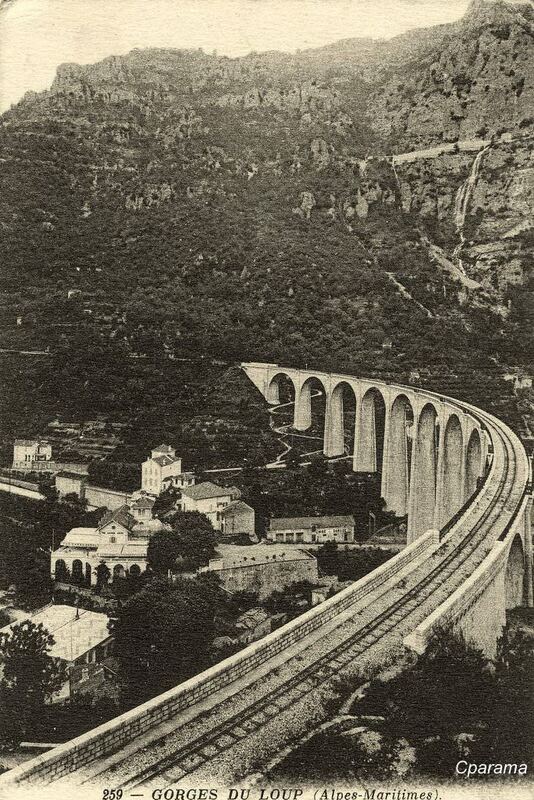 So, although the line was a metre-gauge line, it had a third rail provided along a considerable part of its length. 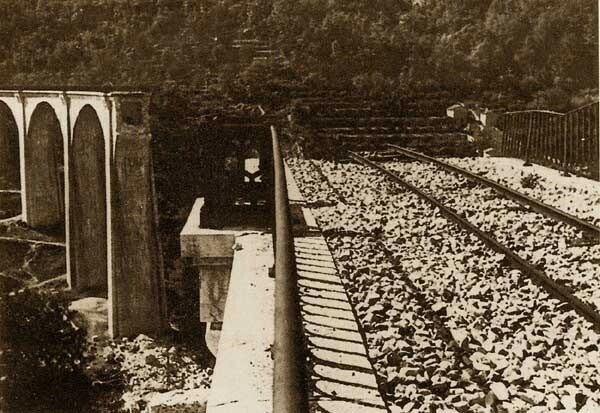 This third rail ensured that the line could accommodate standard gauge rolling stock if required by the military. 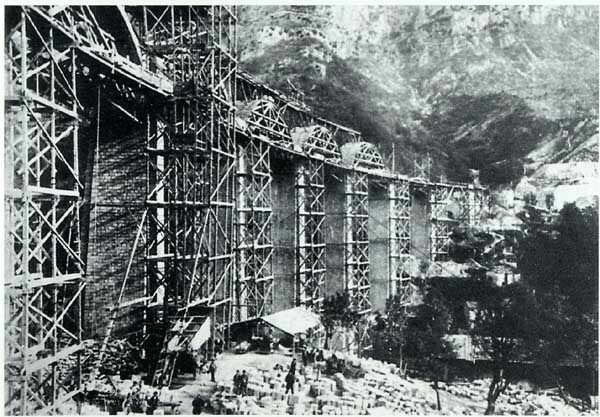 Among these pictures are graceful pictures of the viaduct under construction, in its prime and saddening pictures of its demise including one of the deconstruction work taking place after the War. 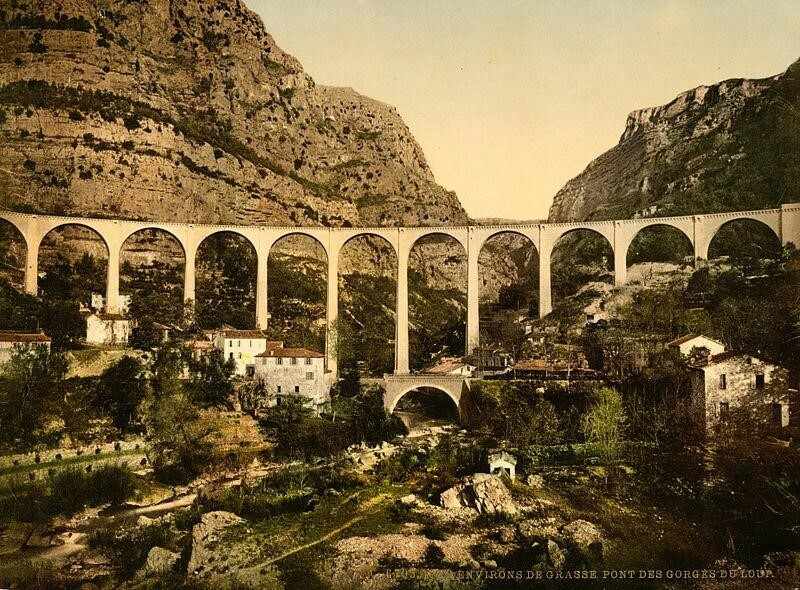 The viaduct was made up of 11 masonry arch spans on masonry piers. 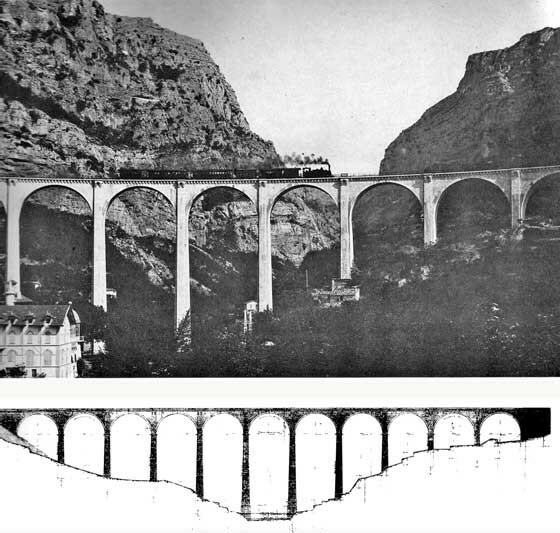 Each arch spanned 20 metres. 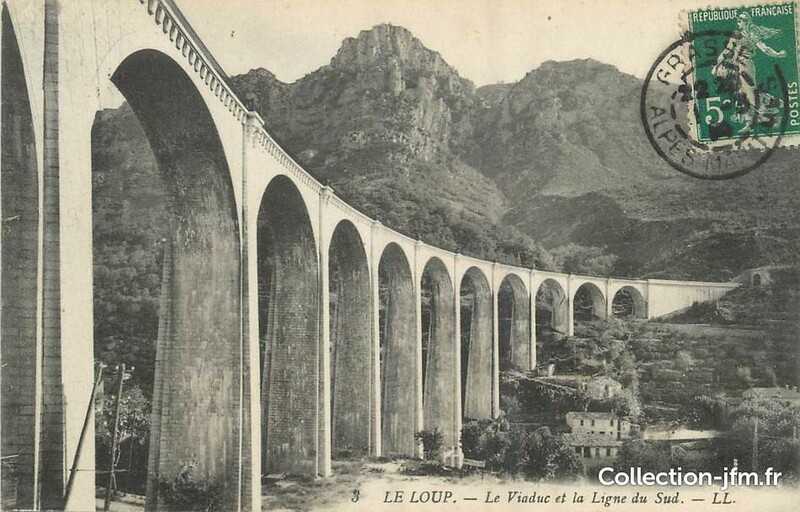 The curved alignment made the viaduct very photogenic. 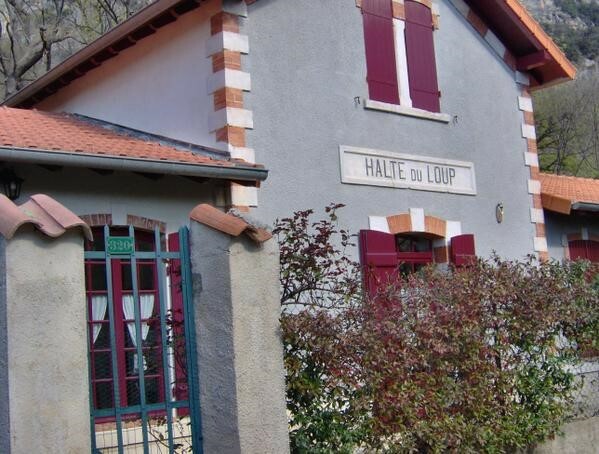 After crossing the viaduct trains immediately enter the station of Halte de Loup. 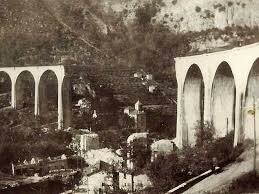 No more than a wayside halt on the line, it can be seen in the postcard view of the Viaduct (204) above. 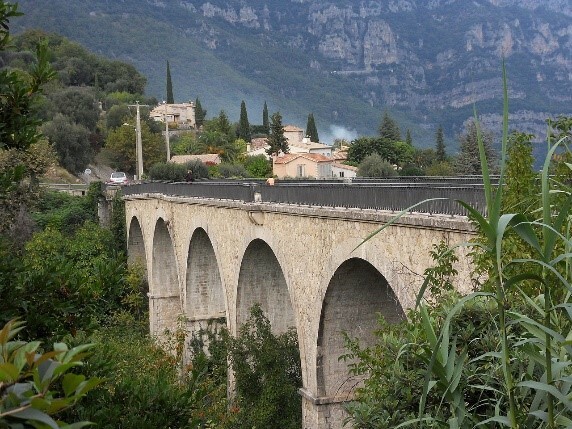 After leaving the Halte, the line follows what is now called Route de l’Ancien Chemin de Fer which travels in a South-Southwesterly direction through Gourdon to reach the Viaduc due Riou-de-Gourdon. 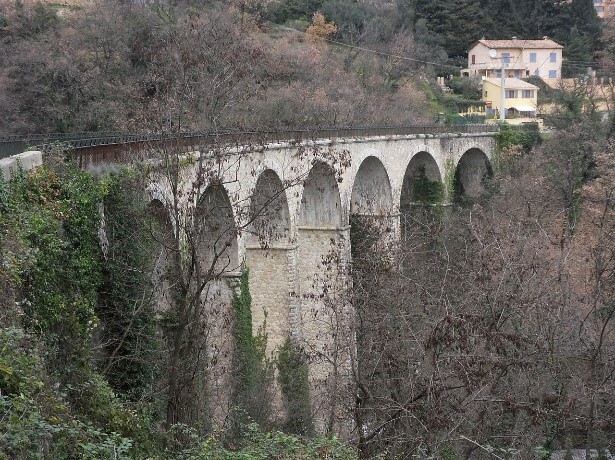 This viaduct is of a similar masonry construction to others on the route and has 8 arched spans of 12 metres. 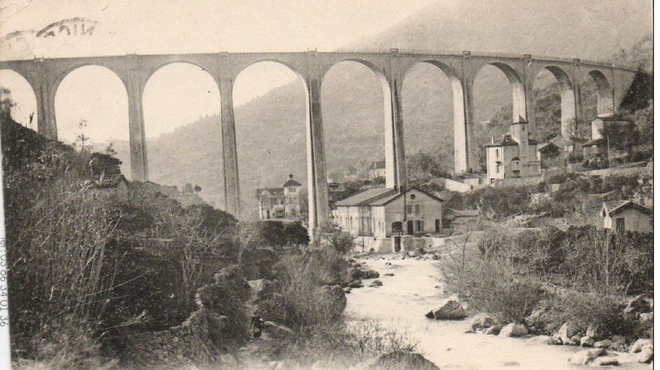 The line continues following what is now the Chemin du Bosquet until it reached the Ribas Viaduct (or Fanerie), by which time the railway route is below the village of Le Bar sur Loup. 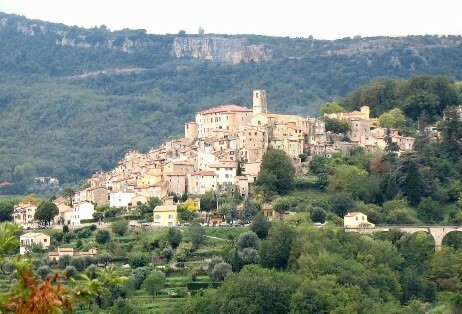 Like Tourrettes sur Loup this is an attractive medieval perched village typical of the area around Nice. 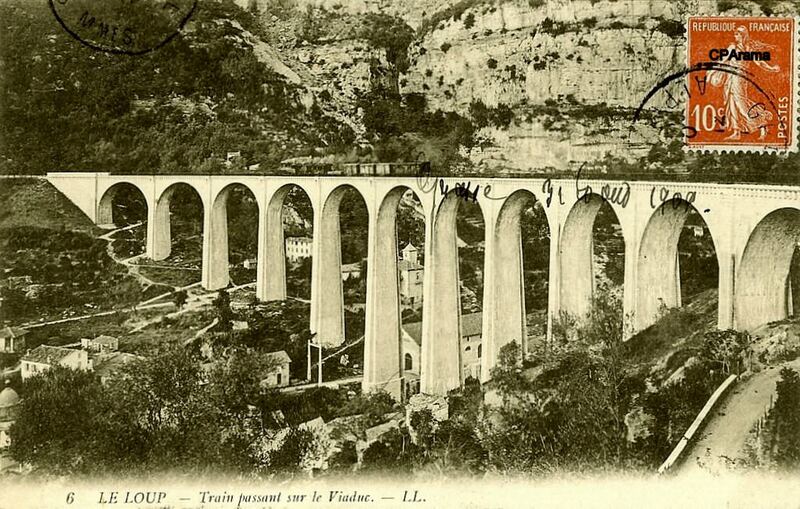 The Ribas or Fanerie Viaduct is barriered off to prevent vehicular usage. 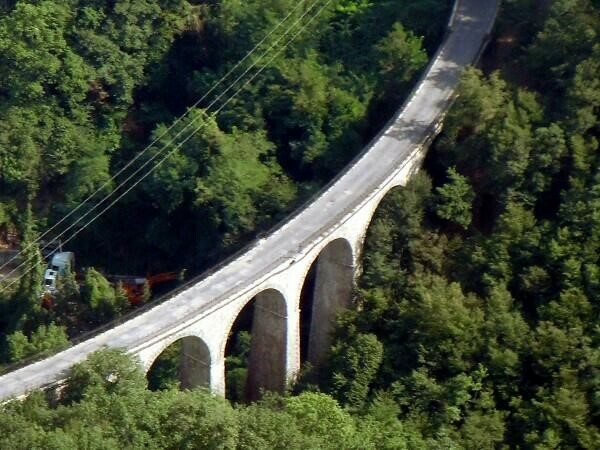 A steel girder spans the road below and the remainder of the structure is a series of masonry arches. 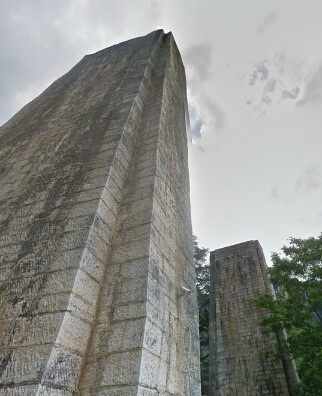 The Google Earth Streetview screenshot shows this well. 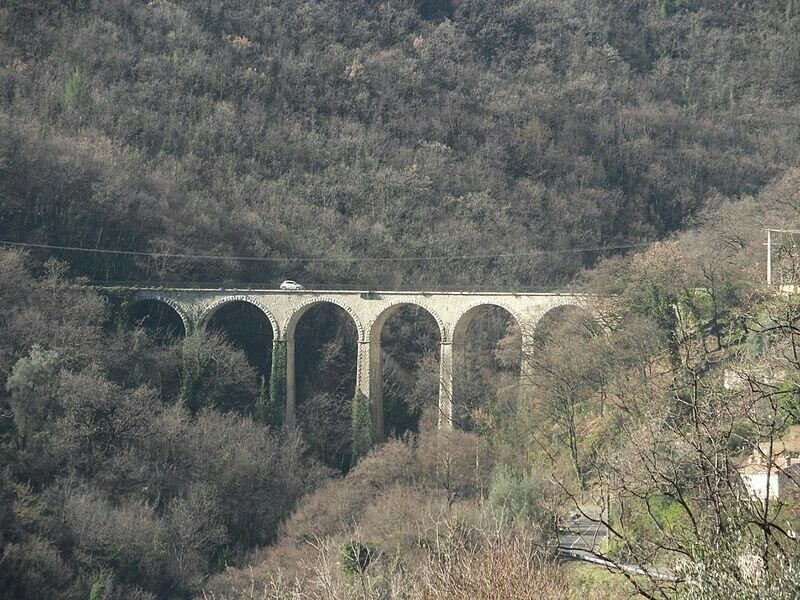 Our pictures of this Viaduct are completed by a view from the D2210 road which runs alongside it. 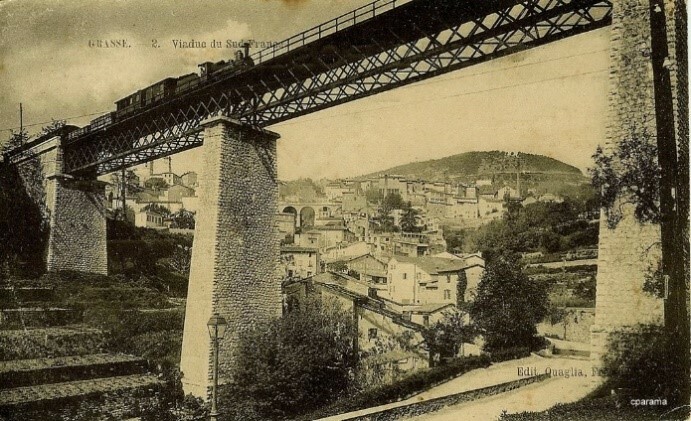 Immediately beyond the Viaduct de Ribas the line curved around the base of the village, flanked on one side by retaining walls and reached the station which is now a school. 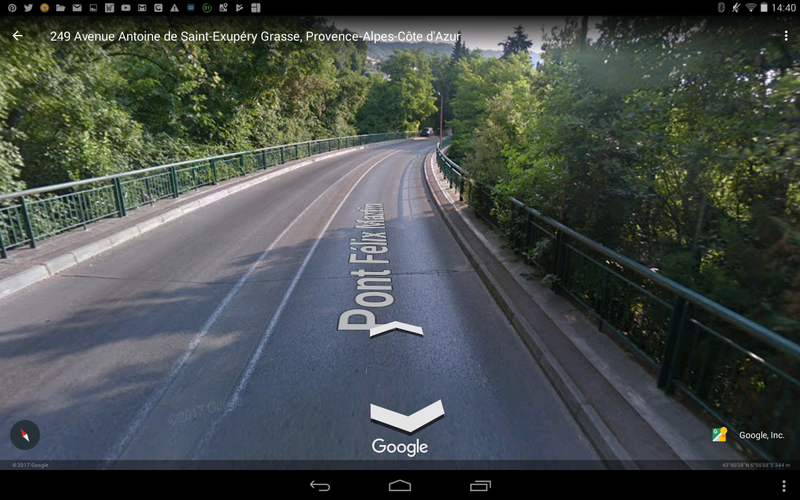 Not surprisingly the road in front of the old station is called Avenue des Ecoles. 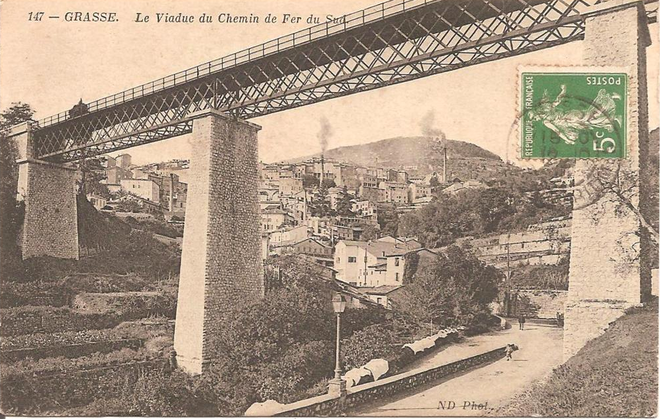 The old line follows this road out of Le Bar Sur Loup and continues along the Chemin de Chateauneuf to the Viaduct Riou-de-Bar and then immediately into the Tunnel Riou-de-Bar. 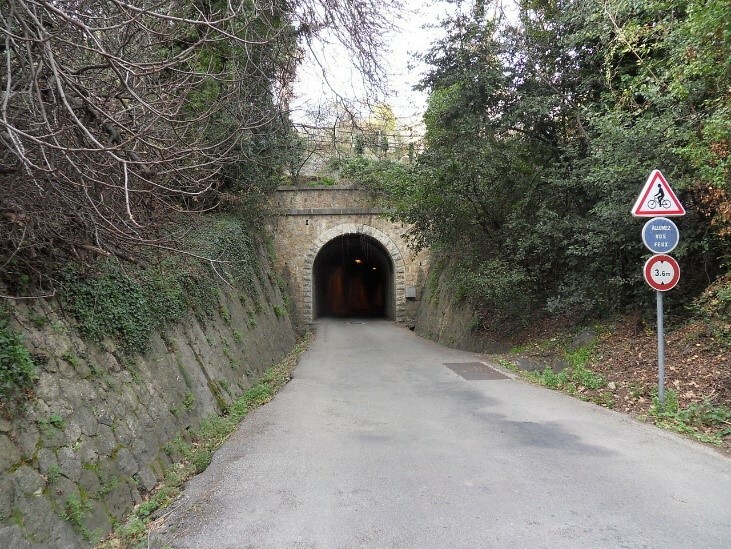 Both portals of the tunnel are shown in the pictures below. 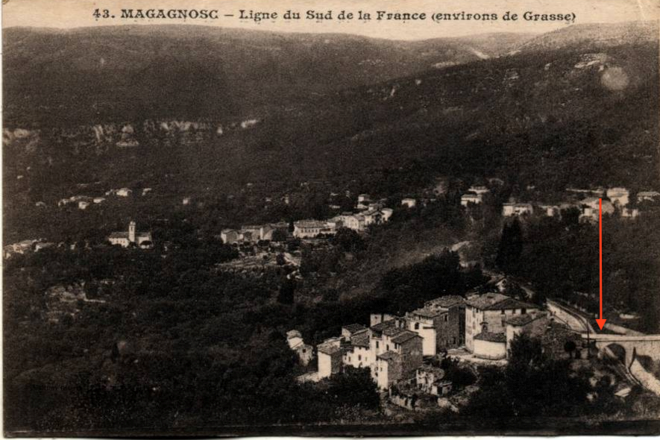 At Tourrettes sur Loup, a quarry cuts into the rocky hill above the current cemetery. 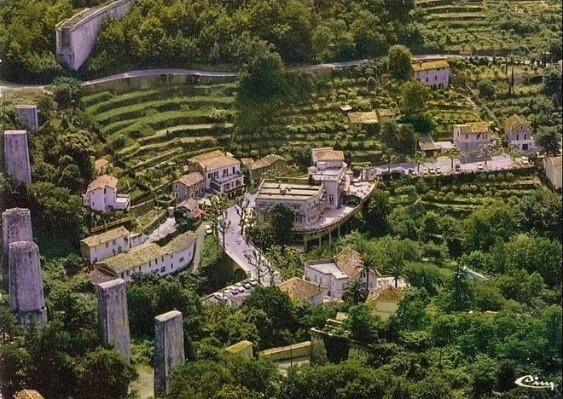 Abandoned nowadays, its location is betrayed by the bare rock facing that village. 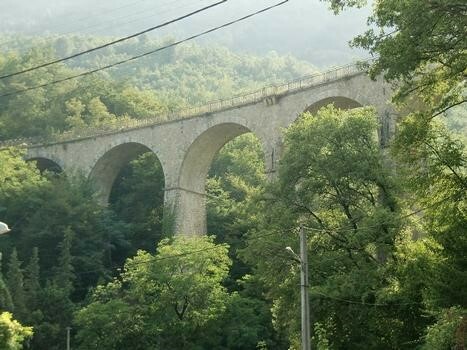 That quarry was used for much of the stonework needed for the various viaducts and tunnels along the Central Var line. It was well used. 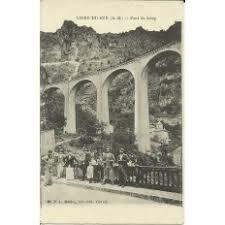 As we have seen, the line travelled through rugged terrain with many hills and deep valleys. 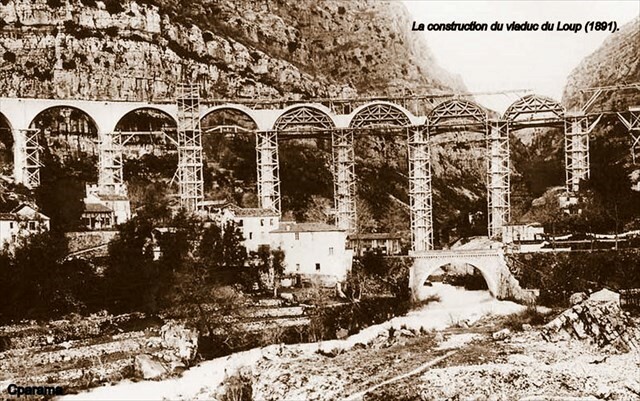 Viaducts, bridges, tunnels and retaining walls were a regular part of the construction work. We noted above that the Central Var line was considered to be of great military significance. For strategic reasons, special arrangements were made to facilitate military transport. 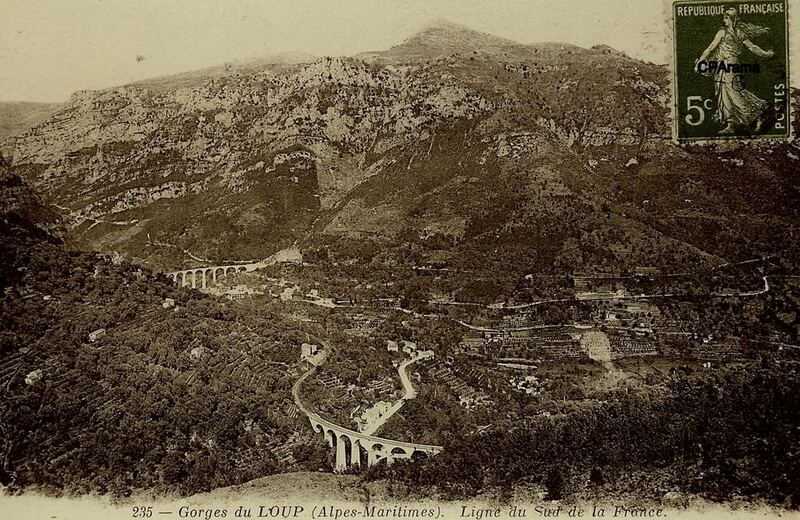 The stations of Saint-Jeannet, Bar-sur-Loup, Grasse and Tourrettes-sur Loup had lengthy sidings (250 to 300 metres long) to allow the passing of long military trains. 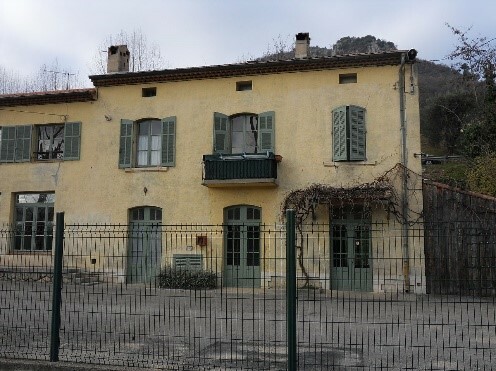 Before we continue our journey towards Grasse. I thought it would be good to see the timetable for 1912 which appeared in an internet search conducted on 28th November 2017. The service was not intensive, only 4 or 5 trains per day, but nonetheless significant given the rural nature of the line. 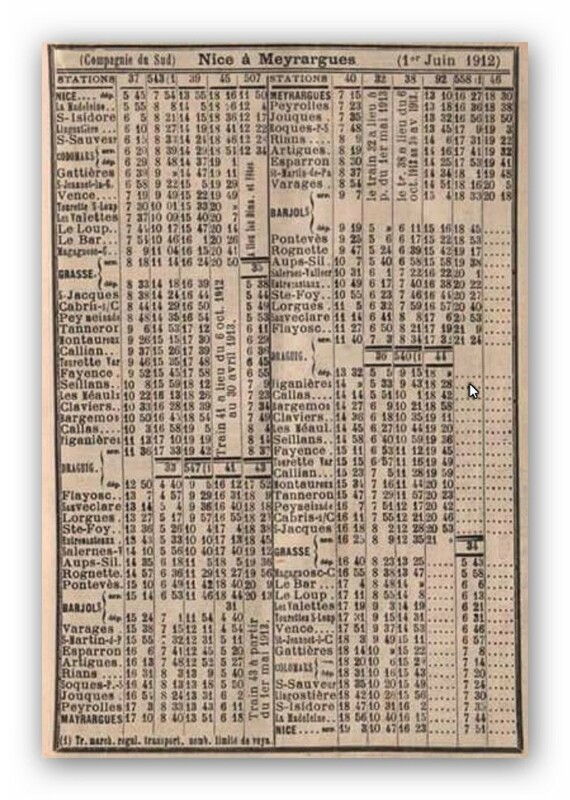 From the various pictures of the trains on the line, most trains appear to have been combined passenger and goods trains, this means that the timetable is probably representative of all the journeys on the route in June 1912. Leaving the Tunnel Riou-de-Bar the route continues to follow the Chemin de Chateauneuf. 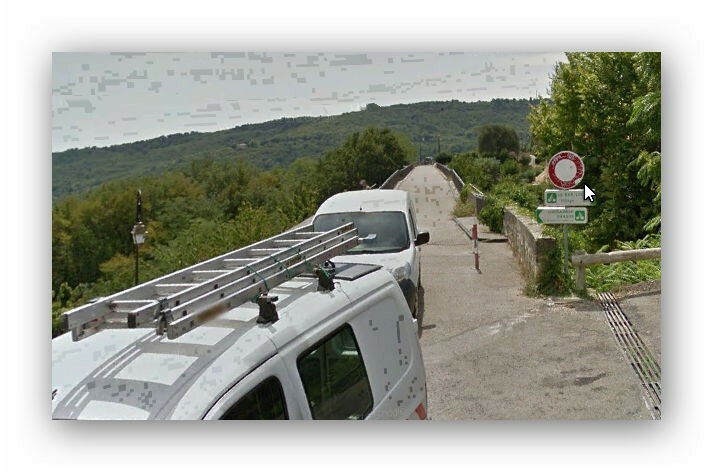 The next station on the route was Maganosc-Châteauneuf reach after passing through the St. Laurent Tunnel (125 metres long 43 ° 40 ’53 “N, 6 ° 57′ 46” E (Coordinates of the Vence end), 43 ° 40 ’52 “N, 6 ° 57′ 38” E (Coordinates of the Grasse end)). 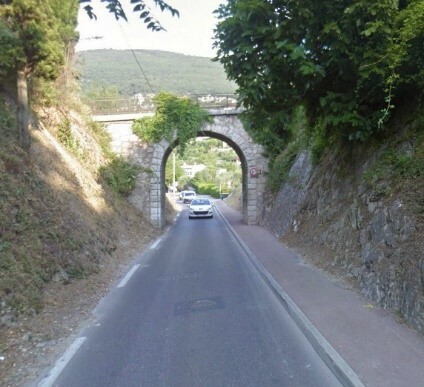 It appears that all evidence of the tunnel at the Grasse end has been obliterated and the tunnel mouth at the Vence end is well hidden in the forest below the D2210 road. After leaving the St. Laurent Tunnel the line immediately crosses a road and passes under the site of some modern buildings before following the line of the Avenue Saint-Laurent. It’s route goes through the concrete blocks on the photograph below . By this time the line was travelling approximately East to West and is shown on the plan view below. 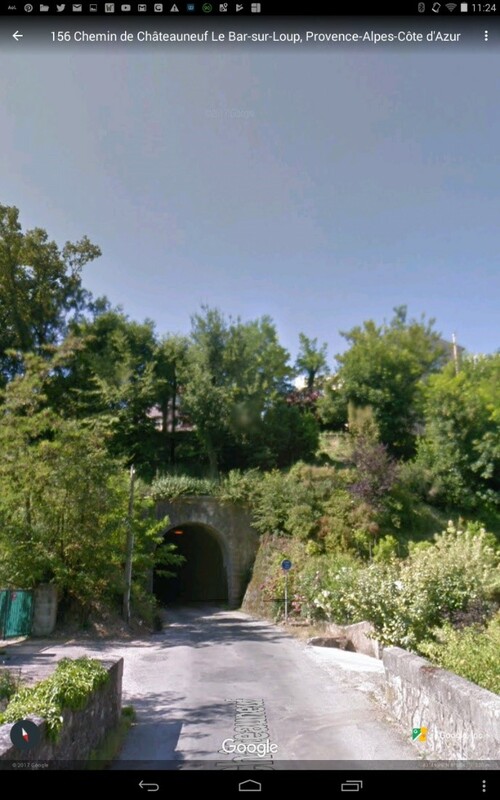 Travelling on from this point the route passes through another short tunnel which has been widened for the modern road and enters the site of the old Mangagnosc-Chateauneuf Station. 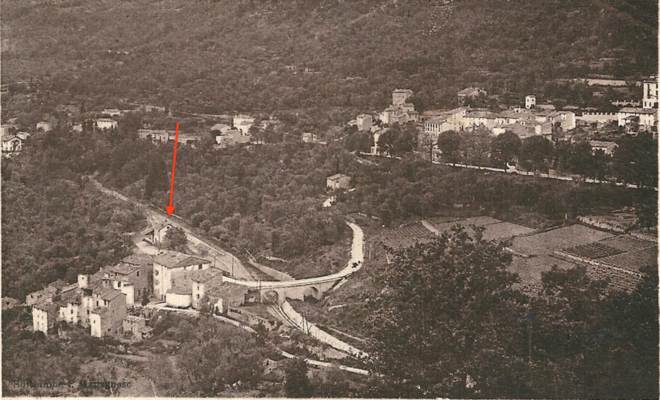 In the first monochrome image below the site of the station is highlighted by a red arrow. 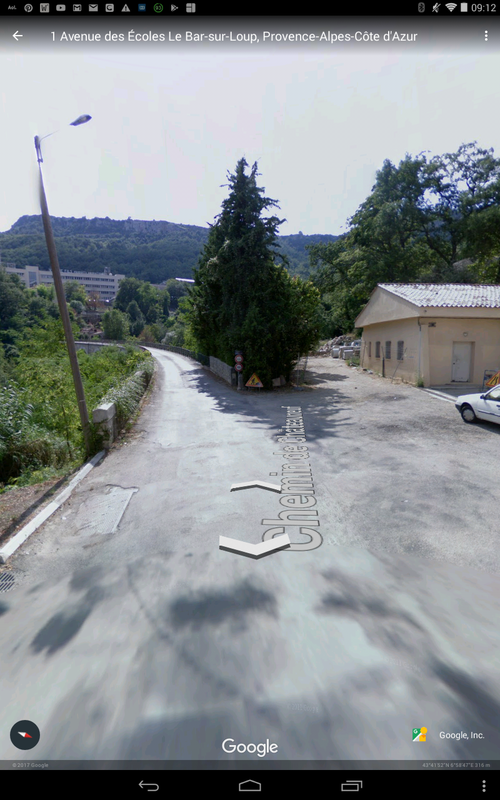 On the second image the red arrow points to the bridge to the West of the station which still remains. The adjacent picture shows it spanning the road to the West of what was the station. 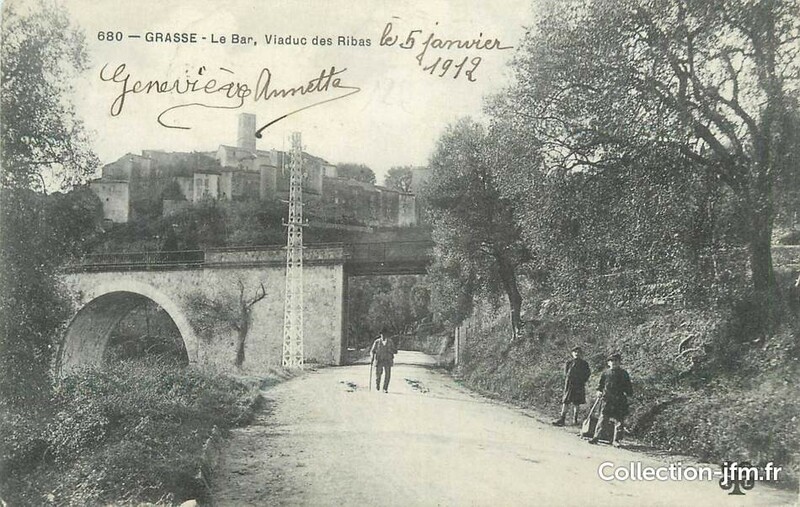 The road is still named Avenue Saint-Laurent and continues towards Grasse, eventually reaching the Pont Felix Martin. 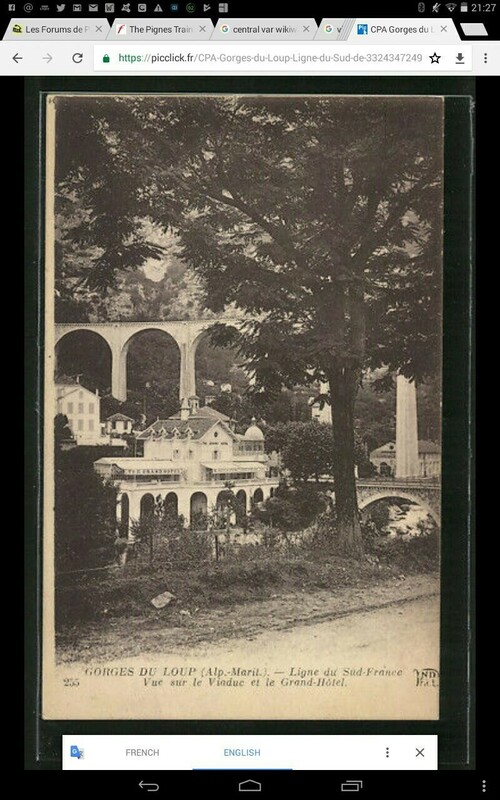 This viaduct is well shrouded in trees. 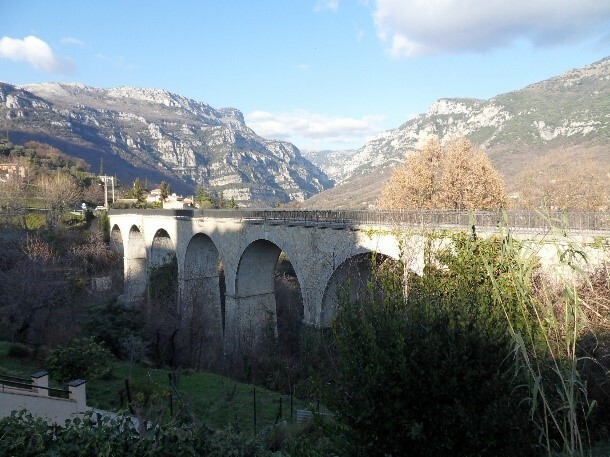 It crosses the Valley of Saint Christophe, in some quarters it is known as the Viaduc de Riou-de-Maganosc. 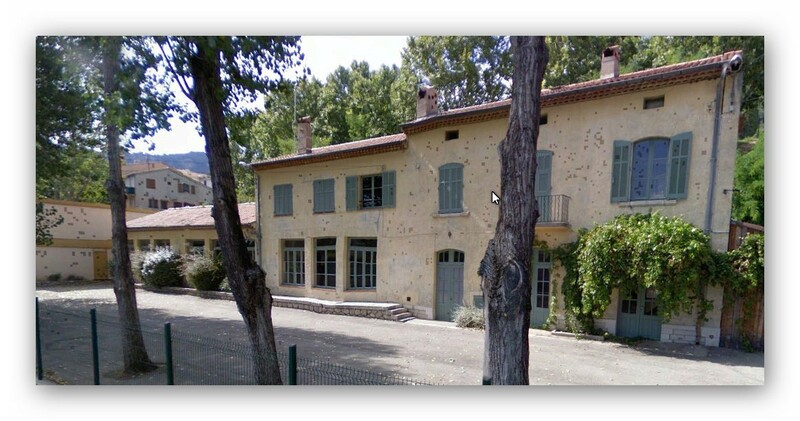 The best photograph available is a Google Earth Screenshot. The picture below is taken looking East back up the line. 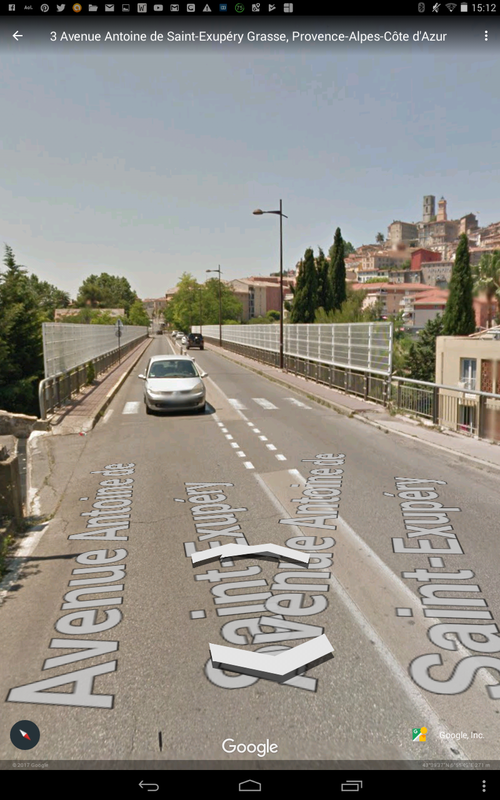 After this Viaduct, the road has a new name – Avenue St. Antione de Exupery. 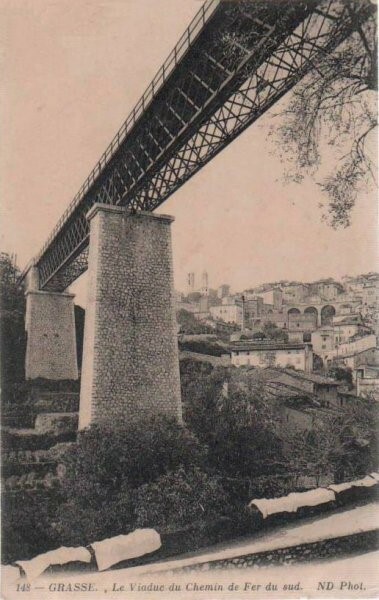 The old line now entered the suburbs of Grasse. 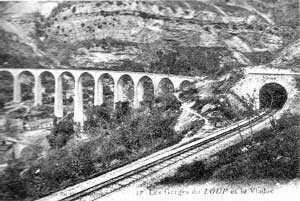 The line was in cutting and after a short distance was spanned by a wrought iron girder bridge taking a narrow accommodation road across the line and then continued at grade round the hillside until reaching the Viaduct de Font-Laugière (sometimes known as Le Pont de Eiffel). 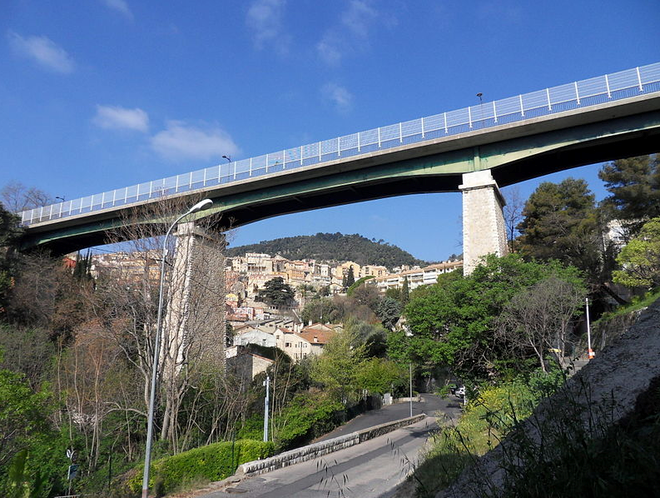 The bridge was the subject of a short report in Nice-Matin entitled “Grasse: Twenty years ago, the metamorphosis of the Font-Laugière viaduct” in 2008, reporting on the work done to the bridge 20 years earlier. 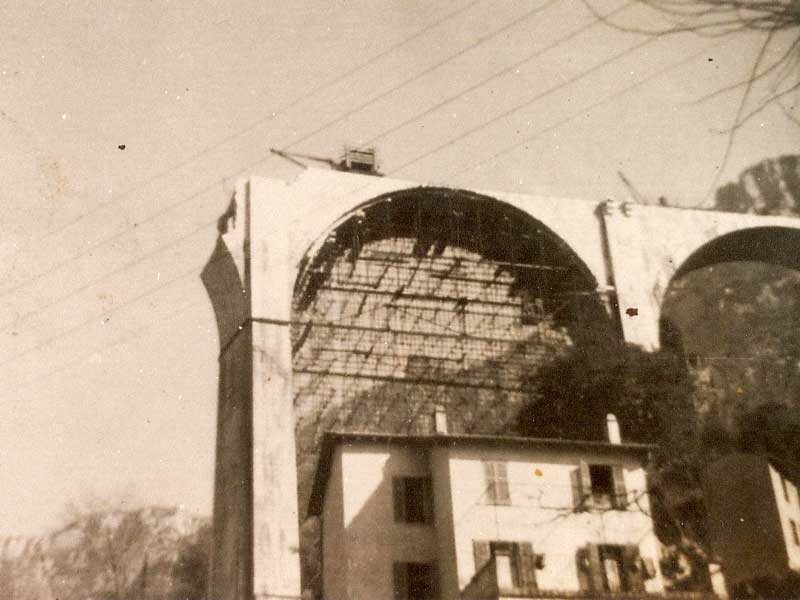 Work started on converting the old bridge into a highway in 1986 and was completed in 1988. 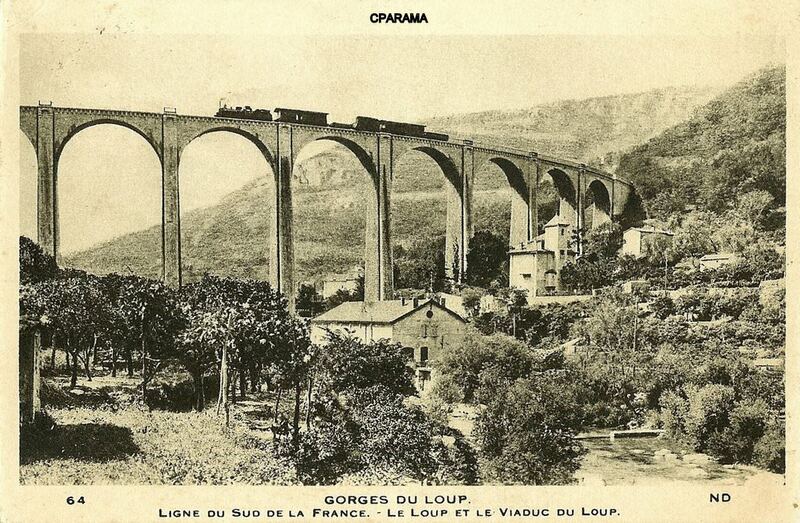 The article included the memories of Georges Rainard, a retired teacher, who remembered, at the age of 15 in 1944 seeing the last steam train cross the viaduct which was soon after the allied landings in Provence and the closure of the line because of the damage done to viaducts further East. 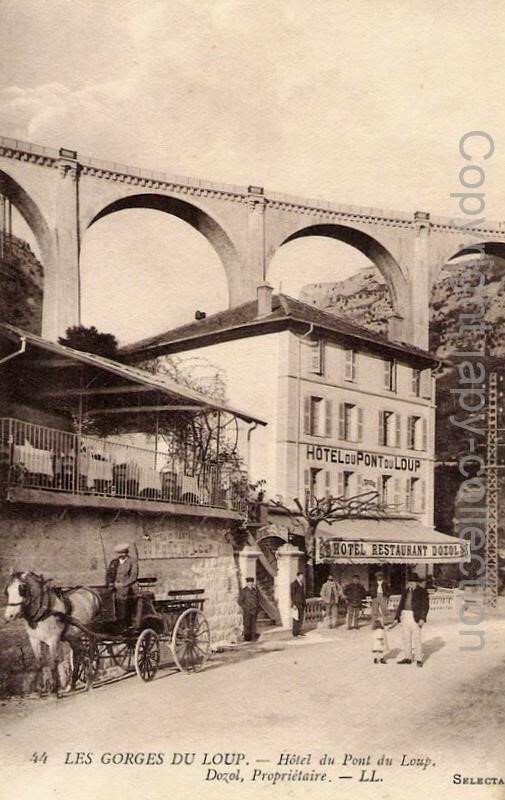 After crossing the viaduct we end up nowadays on the Avenue de Provence in Grasse and within very short shrift we are at the location of Grasse Chemin de Fer du Sud railway station, or at least the site of the station, which is now a road and a modern apartment block! 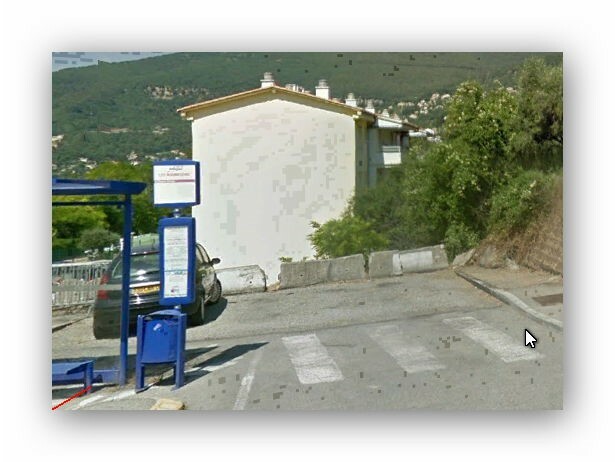 This entry was posted in Railways and Tramways Around Nice, Railways Blog on November 28, 2017 by rogerfarnworth.